With so much snow falling this March, the Pure Mountain staff and I (Jim) thought we’d set ourselves a challenge, and cover the whole Portes du Soleil region in one day! On our day off we woke to a picture perfect bluebird day. We were the first people on to the Chavannes lift in Les Gets, and warmed our legs up by heading straight over to Morzine and catching the Super Morzine lift up to Avoriaz. We made it to Avoriaz by 9:45 and decided to have a little play through ‘The Stash’ Europe’s first eco-friendly board park, built and designed by Burton. We continued through the Lindarets valley and over towards Chatel via the lovely motorway red runs of Plaine Dranse, finishing with the epic Linga run down into Chatel – probably my favourite run in the whole Portes du Soleil, and one that definitely gets the legs burning! 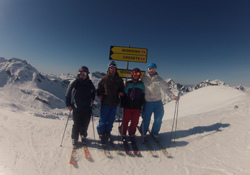 We hopped onto the bus to take us down the road to Chatel, glad of the well-deserved breather, and arrived at the Super Chatel lift ready to ski to the furthest point in the Portes du Soleil from Les Gets – Torgon. Crossing the border into Switzerland, we reached the small ski resort of Torgon and took in the breathtaking views of Lake Geneva. With no time to spare and still 4 resorts to go through before getting to Les Gets, we hot-footed it to Morgins, where we stopped for a quick bite. 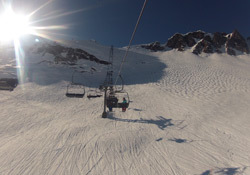 Next up was Les Crosets via Champoussin (land of the T-Bar lifts), where the more adventurous in our number (Eddie & Josh) tried out the huge boardpark. Thankfully they joined us unhurt, so we took the lift up to Avoriaz and back into France. As we were pushed for time we decided to miss out the descent of the Swiss Wall (that’s my excuse, of course it had nothing to do with the moguls being about 6 foot tall and literally as hard as ice!) and head straight down into Avoriaz. Ever conscious of the lifts closing and getting stuck in Morzine, we flew down the last few slopes and were just in time for the Petit Train which took us across Morzine to the Pleney lift… with about 5 mins to spare before it closed! Our adventure took nearly 8 hours and took us through 8 different resorts between France and Switzerland, and I will probably need about 8 days to recover… Now that’s what I call a good day on the slopes! !